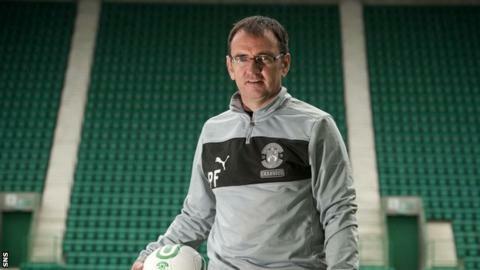 Hibernian manager Pat Fenlon was happy with the Europa League draw which has paired them with either Irish side Drogheda or Malmo of Sweden. He told Hibs' website: "It's not a bad draw from a logistical point of view. Our worst-case scenario would've been to travel halfway around the world. "Drogheda are a decent side and one that I know very well indeed. "But they have got a really tough tie against Malmo, who are a quality European side with a great pedigree." Hibs are likely be away from home for the first leg of their second qualifying round tie on 18 July, with the return leg seven days later. The Easter Road side will have to progress through two further qualifying rounds to reach the Europa League group stage. Fenlon revealed that he watched potential Republic opponents beat Bohemians 3-0 recently and admitted that a match in his home country would be his preference. "I know their manager really well, so from my perspective that would probably be the ideal scenario," he said. "But the fact Malmo are Sweden's most successful club tells its own story. "Now we've got plenty of opportunities to see both teams a few times and obtain all the relevant info before the second qualifying round takes place in a few weeks' time. "If we can play to our best and produce a committed and controlled performance then I believe we've got a decent chance." Hibs finished the Scottish Premier League in seventh position last season and lost to Celtic in the Scottish Cup final. The manager is calling on supporters to renew their season tickets to help the club in the transfer market. He said: "Right now we are actively trying to strengthen the squad by adding quality players. "We want to build on what we did last season and show consistent improvement with resolve, character and skill. "The more supporters that come through the turnstiles and commit to season tickets, the more it helps with who we can bring in this summer. "Everybody connected with the club wants to see progress and that is our primary goal - both in the league and in Europe."